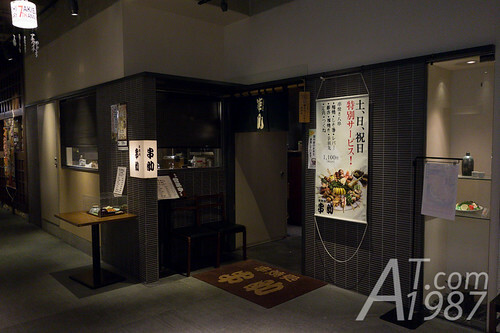 Since the theater is small and many people want to attend the show. The ticket will randomly give to those who reserved the show. There are several types of quotas. One for people live outside Tokyo (Enpou), One for mobile site member, One for Family-Couple, One for female and regular one. There is Super Enpou ticket for those who live outside Japan too. Each quotas has different conditions to enter. The people at STAGE48 write a very good guide how to reserved the ticket. Also you have to make sure that you are eligible to the show you want to see when you plan your trip. Since some show may restricts to the people who birthed on that month or it’s for female only. So you don’t waste the time try to reserve the ticket on that day. In case you win the ticket, you need to contact the ticket counter around the time indicate in the email. Show the email or ticket number indicated in the email, passport and money for ticket fee. The ticket fee is 3,000 yen for Team A, K and B shows. 2,000 for Team Kenkyusei. (Trainee ones.) Female audience will get the 1,000 yen discount on the ticket. If you want to leave the ticket or present to your favorite members, you can do this here. Take note that they can’t accept the forbidden items such as food, electronics device, dangerous goods, etc. Don’t forget to check the leaflets shelf. There are good design leaflet for you to keep. On that day I also got Bandai’s AKB0048 promo cards from it. We still had the time before the show will start. We went to find somewhere for lunch. 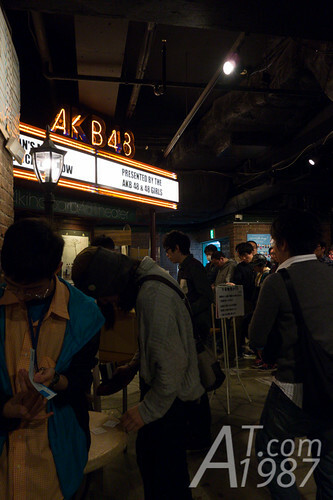 First we went to AKB48 Cafe & Shop but a lot of people were queue here. So I bought some postcard for my friends and went back to Akihabara UDX. 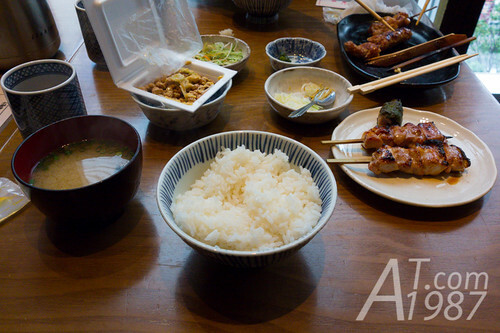 We found the Yakitori restaurant called Kushiyaki-Dokoro KUSHISUKE is quite interesting. So we gave it a try. There aren’t many people here. 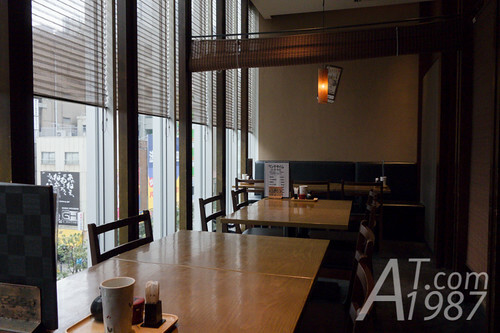 I think this kind of restaurant will be full in the evening because they come to have alcohol drink with the barbecued chicken. Although there is the English menu but it’s like Google Translate translated the menu. Also there are no photo. 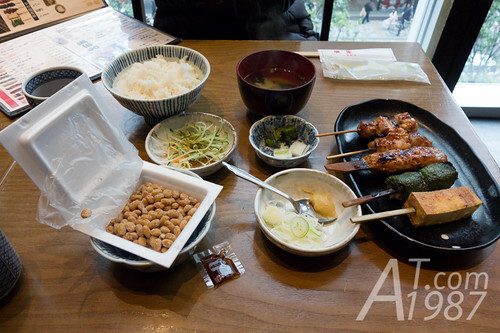 To play save, we ordered barbecued chicken combo set (Yakitori Teishoku) first. When the set was served. I order more by point at the one I wanted. The taste is good but I’m not the fan of Japanese salty barbecue sauce. I prefer the sweet one. After finished having lunch. We walked back to Don Quijote. 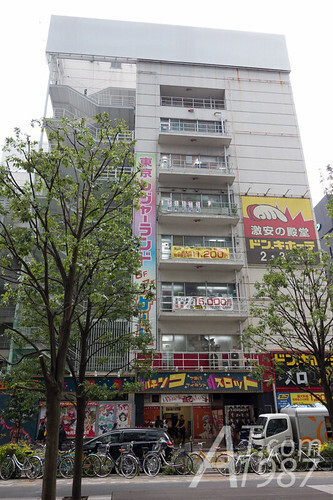 It’s very near to Akihabara UDX but we lost the way on our first time here. I wanted to buy the light stick at AKB48 Shop but it’s too crowd and we have to queue in front the theater before the show starts. 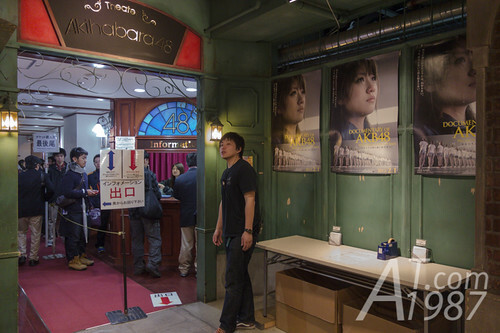 Many people stood in the queue to enter the theater. We had to deposit our shopping bags before go inside the theater. 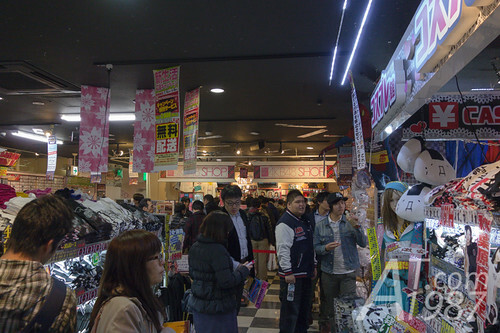 You can use the coin locker around the lobby or use bag deposit service in front of theater gate for 200 yen. To use the service put 200 yen in the vending machine. You will get 2 tickets. Then put your bag in the cardboard box and hand the tickets to staff. Staff will return other ticket to you. You have to keep it for take your bags later. To enter the theater. You need to stand at the queue which has your ticket number. I got ticket No. 231 which is family and couple quota. So I had to stand at the queue for this quota. When the show about to start. 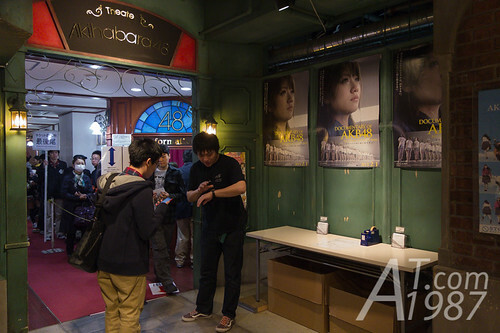 Staff will scan your ticket and ask the people from each queue to enter the theater. Super Enpou quota enters first then Family – Couple, Female, Enpou. 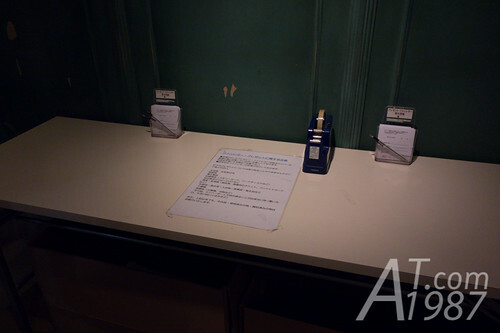 The regular quota queues will enters the theater randomly. On that day there aren’t any Super Enpou quota. So we entered the theater first. They will check the passport again before let us it. The seat position of special quotas are determined beforehand. Super Enpou will take the front left. Family-Couple, Female and Enpou will take the 4th – 6th row in the middle column. In my case, there are 2 Family – Couple persons on that day. We can choose any seats in the 4th row to sit. When we choose our seats.Staff will take the restrict sign from the seat for letting the regular quota to sit here. If you want to sit at the most front row in the middle, you have to enter regular quota and hope that staff will call you to enter the theater first. However the theater is very small for 250 people. To sit in front of the stage may not the good choice because you can’t see all part of the stage. The seat is also very low so the people in front can block you easily. I saw girls who entered behind us choosing the seatat the edge of the column to enjoy the full view of the show. You can also use the mirror on the side of each pillar to see the part of the stage which you can’t see from your seat. 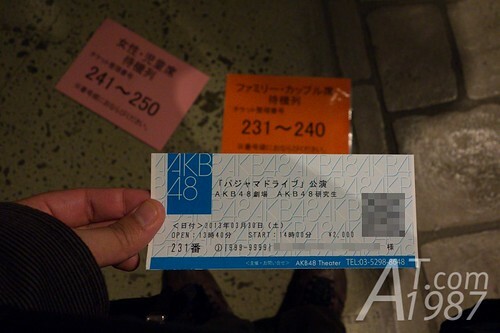 The AKB48 girl will announce the warning when all people are in the theater.